ABCmouse Review – ABCmouse.com review and coupon code info – ABCmouse Early Learning Academy is a kids website centered on helping pre-k, kindergarten and early elementary school. ABCmouse boasts a full online curriculum for kids ages 2-8. Disclaimer – ABCmouse is a pay site and there are both pros and cons to this I will discuss below in this ABCMouse review. ABCmouse is an extremely focused on academics and this becomes apparent when you first logon to the site. The site is very professional-looking and appears very scholastic from the get-go. 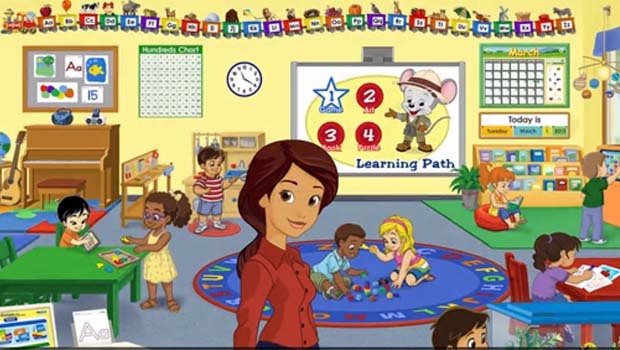 Even though ABCmouse is a pay site, they offer a free non-member learning area. The free area is a great place to explore and is obviously designed to whet the appetite to try to encourage parents to use the much larger pay portions of the site. The free portion of ABCmouse offers – reading lessons, math basics, books, puzzles, games, art and more. Since the site skews toward Kindergarten and pre-K users, the lessons are very basic and age-appropriate. I normally don’t review or critique “pay sites” for our kids website directory. I personally have not used a pay site for my kids and like to explore free options. That said, the benefit of visiting a pay site like ABCmouse is that the site is completely safe and does not feature any advertising or external links. I appreciate this as a potential consumer. Some “free” kids websites feature distracting ad banners, pop ups or inappropriate Google links that parents have to monitor heavily. The educational promises that ABCmouse offer seem very legitimate and I wouldn’t hesitate to explore the pay option if I felt my children would benefit from an extensive pre-k or Kindergarten age learning before they make the jump to elementary school. Yes, there are plenty of free sites that offer learning activities. It just seems that ABCmouse is extremely focused and trustworthy when it comes to scholastic preparation. I’m convinced ABCmouse has a lot to offer scholastically, but doesn’t necessarily seem fun or go the extra mile in the bells and whistles department. ABCmouse is a site that looks and feels like school. This is fantastic if you’re seeking a site solely to enhance your child’s academic skills. If you’re seeking fun and creativity for your child, you may want to click elsewhere. You can try ABCmouse.com for 30 days FREE. Simply click on this link to get started. I hope you found this ABCmouse review helpful.